I couldn’t find a lot out there on How to Teach Spelling and How to Spell, so hopefully if someone is searching, this will help! I just like this program. Nobody asked me to review it. If you want a logical and progressive spelling curriculum which answers “Why?”–then this may be for you and your students. How to Teach Spelling (by Laura Toby Rudginsky and Elizabeth C. Haskell) is not your typical spelling curriculum. I suggest it for teaching in-depth English spelling and phonics with an emphasis on understanding. Most kids don’t need this program, although struggling readers and spellers may benefit from it greatly. If your child is progressing fine in reading and spelling and you’re content with your child being able to spell good enough so that spell check gets them by (and there is NOT a thing wrong with that), this is not your curriculum. Spend your time and energy elsewhere. I chose it probably for myself and my own curiosity in understanding our language. Plus, I had a late reader and wanted to make sure we were proactive in her spelling and phonics foundation. Early on in elementary school we tried other spelling and phonics curriculums; I just didn’t like any of them. 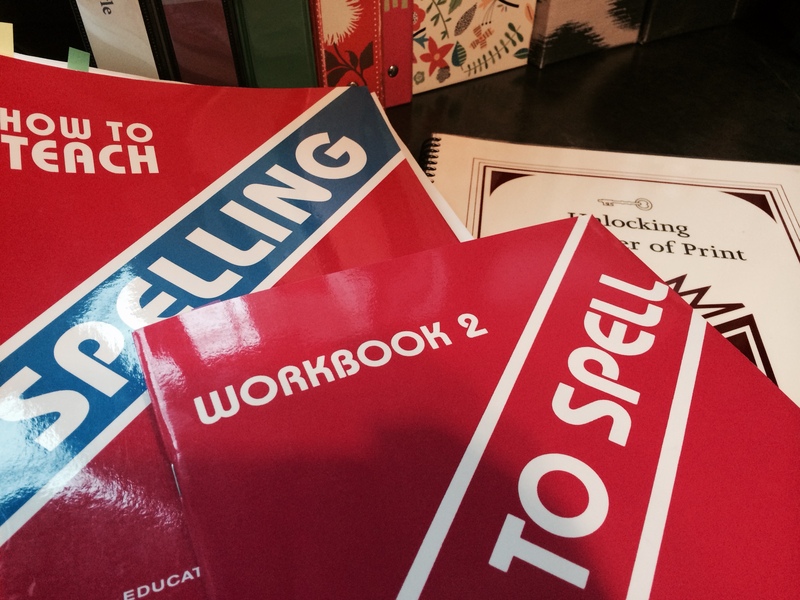 So I have put together a core of texts that I like and I circulate among them, using them to complement How to Teach Spelling and its workbooks called How to Spell. How to Teach Spelling doesn’t require much teacher preparation at all. One can even read the lesson on the spot and teach it adequately. However, it requires a lot of teacher participation (but not necessarily much time), and I do not recommend it for teachers who cannot devote interactive time together with the student. With a child who is not reading and spelling challenged, it doesn’t take much time, maybe 15 minutes on average, but it requires the teacher to at least orally quiz and assess knowledge. Because I am one-on-one with my learner, I can move more quickly and don’t require lots of the writing the text recommends. The main manual where topics and concepts are presented in an orderly, linear fashion: How to Teach Spelling This is not a manual for the students. It is written for the teacher. There are 49 chapters, and they progress forward sequentially, with the most complex, difficult topics at the end. For example, letter sounds and syllables come at the beginning, and more complex suffix rules and letter combinations come at the end. How to Teach Spelling is based on, and meant to be piggy-backed with, an intensive reading and spelling program called Orton-Gillingham. I am not trained in the Orton-Gillingham method, but I have still found How to Teach Spelling to be great. It succinctly marches out all the topics needed to master English spelling and phonics in ONE text. I don’t have to buy a new one each year! There are many recommendations for drills, flashcards, and writing exercises. My girls seem to catch on quickly to the rules and patterns, so I have not needed to do the intensive writing and memorization drills that How to Teach Spelling recommends. 2. I can buy one text and four fairly short workbooks, and they will last me through all the years of teaching spelling. 3. It is black and white. 4. It requires lots of teacher participation and assessment. 5. If the teacher cannot sit and assess, the curriculum will require lots of physical handwriting. 7. It does supply sight words for those naughty, non-compliant words. 8. All phonics and spelling topics are laid out in an orderly fashion in the How to Teach Spelling manual. They are not arranged by difficulty level–but by topic. However, the manual tells you what is appropriate to teach to each grade level. You have to pay attention as you teach from the manual. However, the workbooks are by levels, and do not present more than is appropriate for each level of learner. 9. The workbooks are succinct. 10. I cannot find the answers to the workbooks anywhere. Usually I know the answers, but I’ve had to look up a few. I’m sure there must be answers somewhere! Please see last year’s spelling and phonics write-up for more! This entry was posted in Fifth Grade Curriculum, Homeschooling, Phonics and tagged best spelling program, great phonics and spelling program, haskell, Phonics, program for kids who have trouble spelling, review of how to spell, review of how to teach spelling, rudginsky, spelling, spelling program for kids having troubles, understanding how to spell on May 26, 2015 by thehomeschoolingdoctor. i found a few of the workbooks at rainbowresource.com (Rainbow Resource Center’s website. Maybe you can try there. Rainbow Resource. Will check it out! Thanks.